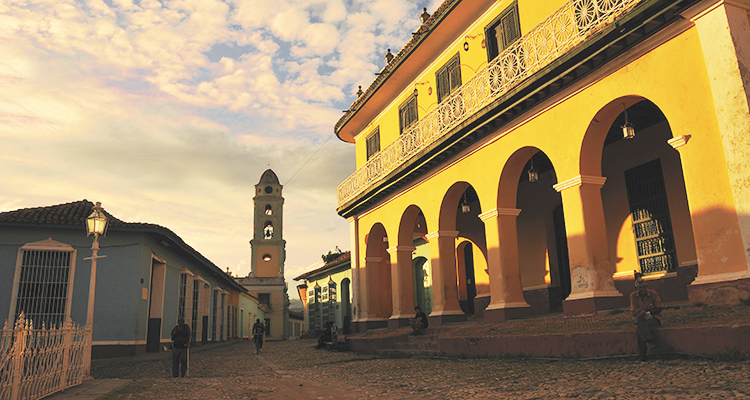 Located in the center of the country, Trinidad keeps colonial vestiges as no other city in Cuba. Declared, together with the neighboring Valle de los Ingenios, a World Heritage Site because of its traditions, architecture and history, Trinidad is protected by Sierra del Escambray and bathed from the South by the Caribbean Sea. There is luxury in its textiles and pottery, in its tunes, in its wonderful landscape and in the ruins of the old sugar mill that perpetuate the history of one of the first villages founded in America. The Program initiates in San Cristobal de la Habana and includes accommodations at any of the hotels suggested by Premium Solways which includes The Level Service at Melia Cohiba or Melia Habana hotels or the superior rooms at Central Park Hotel, Saratoga Hotel or Santa Isabel Hotel. Accommodation at Iberostar Trinidad Hotel located in the center of the villa. Special presentation of San Cristobal de La Habana with its main attractions, culture and history. This tour includes lunch at one of the best restaurants in the city . Exclusive transfer to Trinidad through the Southern highway with stops at the sites of major natural and historical value and a visit to the city of Cienfuegos. Exclusive and unforgettable presentation of the Trinidad Villa, traditions and heritage values. Breakfast is included in Havana and in Trinidad. Exclusive transfer service inter hotel and permanent guide assistance. This program is a reference for a special tailor made program design. Accommodation suggested is based on a double occupancy junior suite room. Limited allotment. The best rooms in the city are guaranteed. Supplements apply depending on the final program , nights and the topics covered. These are reference prices including 1 night minimum of stay in each destination suggested. Once the particular design is finished, prices will be adjusted as per the final services included.Lunch or dinner including a la carte with values up to 30 CUC per customer, drinks not included. Airport taxes, visas, insurance not included. • Travel through the South highway going by Playa Larga and Girón, to visit the fish cave. • Lodging in the best rooms available in the historical center of the village. • Museums, places of interest and options for lunch and dinner. • The possibility to navigate in the calm waters South of Cuba. • Design of custom programs for knowing the center of the country from Trinidad.